Having your car rust checked by a professional, on a consistent basis, is necessary for regular vehicular maintenance. Now, when I say rust checking is necessary, that is mainly if you like your car and you want it to last a long time. Also, if you would like to get some money back for your vehicle when it comes time to sell it, professional rust checks can be hugely beneficial. This is especially true if you live in Canada, with its extreme weather conditions. Reduce your vehicle’s vulnerability to snow, ice, salt, and intense sun through regular rust checks. Unprotected autos will be left exposed to the harsh road conditions of Canadian winters. If your car has not been rust checked, it opens the potential for salt and moisture to get stuck in the crevasses of the metal on your vehicle. This invasive salt and moisture will then sit in the nooks and crannies until the weather starts to warm up again. This heat then acts like a trigger, inciting the hidden salt to begin corroding and rusting the metal on your vehicle. Rust and corrosion is not a reversible process. Once rust has eaten away the metal on your car, it is gone for good. That is why preventative measures, in the form of scheduled rust checks, is so important. Valvoline Express Care, located in Brampton, is a professional automotive service center that can handle all your maintenance needs. The rust check specialists at Valvoline Express Care are dedicated to the safety and protection of your vehicle. Using top of the line equipment and products, these specialists will ensure long-lasting from rust and corrosion. Most vehicles are made up of primarily metal components. This provides an ideal opportunity for rust to develop and flourish. Any chip or scratch in the paint, or the undercarriage of your car, invites the possibility for rust to establish itself. Rust Check services will be tailored to your specific vehicle, as all vehicle designs and contours are different. Every vehicle has various joints, hinges, seams, cracks, and creases. These are all ideal spots for rust to hide. This first step involves dispensing a delicate, oil-based liquid that is designed to get into all these hidden crevasses, providing protection for these hard to reach spots in your car. 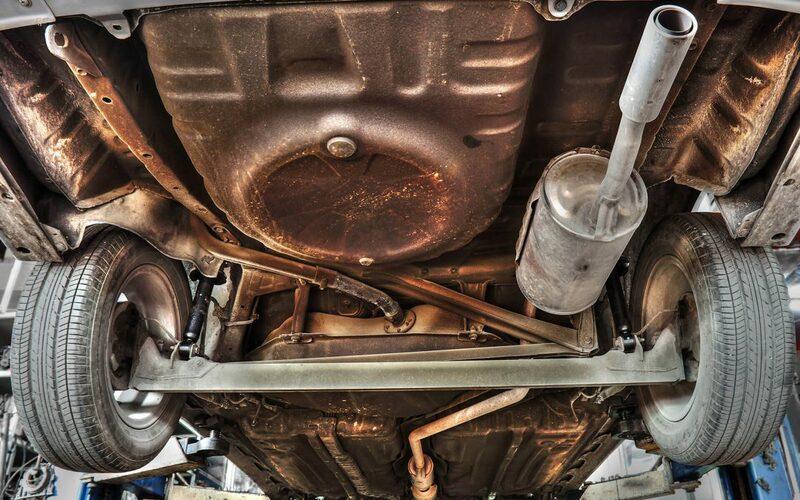 This second step focuses on the undercarriage of your vehicle. This stage provides protection for all the exposed and potentially vulnerable areas underneath your vehicle. A protective coat is applied to the undercarriage of your automobile, to lubricate and safeguard it against chips, cracks, and blemishes. Prolong the life of your car or truck regular rust checks. It helps protects the metal components of your vehicle from rust and corrosion, while preventing the electrical components from seizing up on you. Keeping all the parts of your vehicle in good working order is one of the best way to ensure it has a long and prosperous existence. Rust is formed when metal is exposed to moisture and oxygen for extended periods of time. Rust checks help prevent this from happening. The rust check formula that is distributed into the hard to reach places in your car, actually bonds to the metal to keep moisture out of these problematic areas. Rust check serves to repel any water that comes into contact with your vehicle, during any season. Rust checking provides lubrication for the electrical components in your car, to help prevent them from seizing or malfunctioning. For example, it can stop door locks and power windows from jamming or freezing. It is also lubricating for the various nuts and bolts found throughout your vehicle, preventing them from stripping or locking. The lubrication afforded by rust checks also help eliminate any creaking, shaking, or squeaking from hinges or cables. Basically, it tightens up the components of your vehicle, optimizing performance. All of these benefits add up to the preserved value of your vehicle. Keep it looking great and running smoothly, with regular rust checks.